Light projects through scrollwork to produce compelling patterns of light and shadow. Make an elegant statement with the VOLT® ShadowMaster Path and Area light. This unique patent-pending estate-sized luminaire features charming scrollwork and bold embellishments. At night, light shines through the designs to create a compelling pattern of light and shadow. Perfect for larger homes and properties. The ShadowMaster™ is the newest VOLT® innovation in path and area lighting. Being the first estate sized fixture, it’s bigger (35 inches tall) and more robust (thicker stem and bigger stake) than your typical area light. This fixture is impressive in the daylight and breathtaking at night. 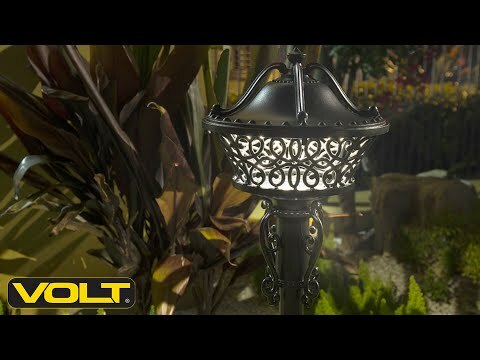 Become the true shadow master by installing this fixture throughout your own outdoor oasis. VOLT® has been awarded the Product Innovation Award (PIA) for the ShadowMaster™ LED Path & Area Light by Architectural SSL (Solid-State Lighting) Magazine. Learn More. Dimensions Entire Fixture: 34.50" x 11.00" Stake: 13" x 3"